Ray Machowski telling Claude that he needs his help getting to Francis International Airport as the CIA are attempting to apprehend him. 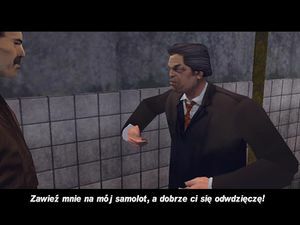 Marked Man is a mission in Grand Theft Auto III given to protagonist Claude by corrupt police officer Ray Machowski from the toilet block at the Belleville Park district of Staunton Island, Liberty City. Claude drops by the toilet block in Belleville Park. Ray tells Claude that he is a "marked man" and needs to escape Liberty City. He wants Claude to take him to the Francis International Airport so he can catch his plane out of the city to Miami. If Claude succesfully drives Ray to the airport, Ray will reward him some items. Claude and Ray start to make their way to the airport. However, the Shoreside Lift Bridge is guarded by CIA agents, so Claude finds an alternate route, one being the Porter Tunnel. Claude drives through the Porter Tunnel, and he and Ray eventually reach the airport before Ray misses his flight. Once they reach the airport, Ray gives Claude the keys to a lockup in Newport, and enters the airport. After so, he heads to the lockup. Ray pages Claude to take care of the bulletproof Patriot he has been rewarded; a rocket launcher, a sniper rifle, an M16, and a flamethrower as well as some money is also inside. Ray Machowski: You weren't followed? Good. This is it, I'm way over my head and I'm starting to drown here! The CIA seem to have a vested interest in SPANK and they don't like us screwing with the Cartel. I'm a marked man, so I'm getting out of here. Get me to my flight at the airport and I'll make it worth your while! Ray Machowski: Here's a key to a lock-up. You'll find some cash and 'supplies' I'd stashed in case things got tight. See y'around. The reward for completing the mission is $20,000, as well as the items from the lockup, including the bulletproof Patriot. The best way to complete this mission is to get a fast car (eg. an Infernus, Cheetah, Stinger, or Banshee), drive it into the subway network via a subway station and drive to the Francis International Airport subway station. After Ray enters the airport, the subway system can be used to get to Ray's lock-up. That way, the CIA cannot attack the player and if the player has a wanted level, the police cannot follow and bust the player. The player must be careful, though, to avoid getting lost in the subway system en route to the airport. The CIA agents that are watching the bridge are heavily armed. The agents at the entrances/exits will carry Uzis and agents beyond and on the span will carry either an AK-47 or an M16. It is possible to get to Francis International Airport via the bridge using a Rhino tank, which is heavily damage-proof and will not get any harm from the bullets of the weapons used by the CIA agents. The bulletproof Barracks OL available in "Arms Shortage" will also make this mission considerably easier. The agents are sharpshooters, so it will be rare for them to miss when the player is in range. However, like with all other armed pedestrians, they will be attacked by some pedestrians armed with guns (if the player has activated the "Pedestrians have weapons" cheat). Prior to leaving Ray at the airport, there will be agents on both sides of the bridge, all the way down to the intersection leading down to the airport. After leaving Ray, only the ones standing on the road leading up to the bridge coming from the airport remain. This mission is the only one in GTA III to make mention of Miami. It can be assumed the idea of using its fictional counterpart, Vice City, had, back then in 2001, yet to materialize, despite a Miami-based Vice City in Grand Theft Auto 1 already existing. It is also possible that, while Vice City is based on the real life Miami, both cities co-exist in Florida in the GTA world. There is further evidence of both coexisting: certain billboards in Vice City say "Move Over, Miami". Claude and Ray Machowski arriving at the airport. Ray Machowski handing Claude the keys to a garage in Newport. Ray Machowski running into one of the airports Terminal B.
Claude running to Ray Machowski's garage in Newport. Claude being paged by Ray Machowski shortly after entering the garage. This page was last modified on 1 May 2015, at 23:02.